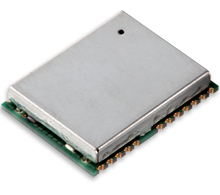 NavSync Ltd. offers the TrineX CW27, a self-contained GPS receiver module based on the NemeriX NX3 assisted-GPS single chip receiver with the NemeriX Extended Ephemeris feature. The TrineX occupies 24 × 24 millimeters of printed circuit board space and connects directly to the host system through a UART using NMEA protocols. It incorporates an ARM7-based application processor. According to the company, the device has been specifically developed for mobile hardware platforms running off batteries, where power consumption and small size are crucial. NavSync Ltd. offers the TrineX CW27, a self-contained GPS receiver module based on the NemeriX NX3 assisted-GPS single chip receiver with the NemeriX Extended Ephemeris feature. The TrineX occupies 24 × 24 millimeters of printed circuit board space and connects directly to the host system through a UART using NMEA protocols. It incorporates an ARM7-based application processor. According to the company, the device has been specifically developed for mobile hardware platforms running off batteries, where power consumption and small size are crucial. The unit has a reported signal-tracking capability down to –159 dBm and operates on a single 3.3VDC power supply. NavSync Ltd., Aurora, Illinois USA.